For other uses, see Royal Court. For alternative meanings of the word "court", see Court (disambiguation). Royal courts may have their seat in a designated place, several specific places, or be a mobile, itinerant court. In the largest courts, the royal households, many thousands of individuals comprised the court. These courtiers included the monarch or noble's camarilla and retinue, household, nobility, those with court appointments, bodyguard, and may also include emissaries from other kingdoms or visitors to the court. Foreign princes and foreign nobility in exile may also seek refuge at a court. Near Eastern and Eastern courts often included the harem and concubines as well as eunuchs who fulfilled a variety of functions. At times, the harem was walled off and separate from the rest of the residence of the monarch. In Asia, concubines were often a more visible part of the court. Lower ranking servants and bodyguards were not properly called courtiers, though they might be included as part of the court or royal household in the broadest definition. Entertainers and others may have been counted as part of the court. 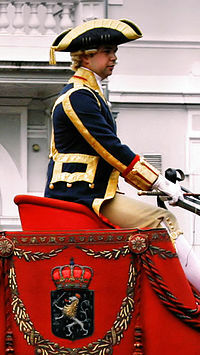 A royal household is the highest-ranking example of patronage. A regent or viceroy may hold court during the minority or absence of the hereditary ruler, and even an elected head of state may develop a court-like entourage of unofficial, personally-chosen advisors and "companions". The French word compagnon and its English derivation "companion" literally connote a "sharer of the bread" at table, and a court is an extension of the great individual's household. Wherever members of the household and bureaucrats of the administration overlap in personnel, it is reasonable to speak of a "court", for example in Achaemenid Persia, Ming China, Norman Sicily, the Papacy before 1870 (see Papal Household), and the Austro-Hungarian Empire. A group of individuals dependent on the patronage of a great man, classically in ancient Rome, forms part of the system of "clientage" that is discussed under vassal. Individual rulers differed greatly in tastes and interests, as well as in political skills and in constitutional situations. Accordingly, some founded elaborate courts based on new palaces, only to have their successors retreat to remote castles or to practical administrative centers. Personal retreats might arise far away from official court centres. Etiquette and hierarchy flourish in highly structured court settings, and may leave conservative traces over generations. Most courts featured a strict order of precedence, often involving royal and noble ranks, orders of chivalry, and nobility. Some courts even featured court uniforms. One of the major markers of a court is ceremony. Most monarchal courts included ceremonies concerning the investiture or coronation of the monarch and audiences with the monarch. Some courts had ceremonies around the waking and the sleeping of the monarch, called a levée. Orders of chivalry as honorific orders became an important part of court culture starting in the 15th century. They were the right of the monarch, as the fount of honour, to create and grant. The earliest developed courts were probably in the Akkadian Empire, in Ancient Egypt, and in Asia in China during the Shang dynasty, but we find evidence of courts as described in the Neo-Assyrian Empire and in Asia in the Zhou Dynasty. Two of the earliest titles referring to the concept of a courtier were likely the ša rēsi and mazzāz pāni of the Neo-Assyrian Empire. In Ancient Egypt we find a title translated as high steward or great overseer of the house. The royal courts influenced by the court of the Neo-Assyrian Empire such as those of the Median Empire and the Achaemenid Empire would also have identifiable developed courts with court appointments and other features associated with later courts. One of the series of the reliefs of the Persian and Median dignitaries at Apadana stairs of Persepolis, all with weapons, but in a casual air—a rare depiction of an ancient court ceremony. The imperial court of the Achaemenid Empire at Persepolis and Pasargadae is the earliest identifiable complex court with all of the definitive features of a royal court such as a household, court appointments, courtiers, and court ceremony. Though Alexander the Great had an entourage and the rudimentary elements of a court it was not until after he conquered Persia that he took many of the more complex Achaemenid court customs back to the Kingdom of Macedonia to develop a royal court which would later influence the courts of Hellenistic Greece and the Roman Empire. The Sasanian Empire adopting and developing the earlier court culture and customs of the Achaemenid Empire would also influence again the development of the complex court and court customs of the Roman Empire and Byzantine Empire. The imperial court of the Byzantine Empire at Constantinople would eventually contain at least a thousand courtiers. 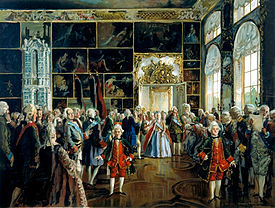 The court's systems became prevalent in other courts such as those in the Balkan states, the Ottoman Empire, and Russia. Byzantinism is a term that was coined for this spread of the Byzantine system in the 19th century. The courts of Chinese Emperors were among the largest and most complex of all. The Han Dynasty, Western Jin Dynasty, and Tang Dynasty occupied the large palace complex at Weiyang Palace located near Chang'an, and the later Manchu dynasty occupied the whole Forbidden City and other parts of Beijing, the present capital city of China. However, by the Sui Dynasty (est. 581) the functions of the royal household and the imperial government were clearly divided. During the Heian period, Japanese Emperors and their families developed an exquisitely refined court that played an important role in their culture. After the collapse of the Roman Empire in the West, a true court culture can be recognized in the entourage of the Ostrogoth Theodoric the Great and in the court of Charlemagne. In the Roman East, a brilliant court continued to surround the Byzantine emperors. In Western Europe, consolidation of power of local magnates and of kings in fixed administrative centres from the mid-13th century led to the creation of a distinct court culture that was the centre of intellectual and artistic patronage rivalling the abbots and bishops, in addition to its role as the apex of a rudimentary political bureaucracy that rivalled the courts of counts and dukes. The dynamics of hierarchy welded the court cultures together. Many early courts in Western Europe were itinerant courts that traveled from place to place. Local courts proliferated in the splintered polities of medieval Europe and remained in early modern times in Germany and in Italy. Such courts became known for intrigue and power politics; some also gained prominence as centres and collective patrons of art and culture. In medieval Spain (Castile), provincial courts were created. Minor noblemen and burguesie allied to create a system to oppose the monarchy on many policy issues. They were called "las Cortes de Castilla". These courts are the root of the current Spanish congress and senate. The courts of the Duchy of Burgundy and the Kingdom of Portugal were particularly influential over the development of court culture and pageantry in Europe. The court of Philip the Good was considered one of the most splendid in Europe and would influence the development of court life later on for all of France and Europe. Later Aliénor de Poitiers of the Burgundian court would write one of the seminal books on court etiquette Les honneurs de la cour (Honors of the Court). 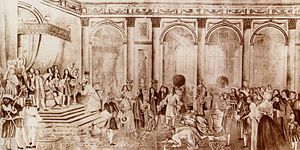 Court life would reach its apogee of culture, complexity and etiquette at the courts of Versailles under Louis XIV of France and the Hofburg under the Habsburgs. As political executive functions generally moved to more democratic bases, noble courts have seen their function reduced once more to that of a noble household, concentrating on personal service to the household head, ceremonial and perhaps some residual politico-advisory functions. If republican zeal has banished an area's erstwhile ruling nobility, courts may survive in exile. Traces of royal court practices remain in present-day institutions like privy councils and governmental cabinets. A colonnade in Pharaoh Amenhotep III's royal court at Luxor. A series of Pharaohs ruled Ancient Egypt over the course of three millennia (circa 3150 BC to 31 BC), until it was conquered by the Roman Empire. In the same time period several kingdoms with their own royal courts flourished in the nearby Nubia region, with at least one of them, that of the so-called A-Group culture, apparently influencing the customs of Egypt itself. From the 6th to 19th centuries, Egypt was variously part of the Byzantine Empire, Islamic Empire, Mamluk Sultanate, Ottoman Empire and British Empire with a distant monarch. The Sultanate of Egypt was a short lived protectorate of the United Kingdom from 1914 until 1922, when it became the Kingdom of Egypt and Sultan Fuad I changed his title to King. After the Egyptian Revolution of 1952 the monarchy was dissolved and Egypt became a republic. In the Horn of Africa, the Kingdom of Aksum and later the Zagwe Dynasty, Ethiopian Empire (1270–1974), and Aussa Sultanate all had royal courts. Various Somali Sultanates also existed, including the Adal Sultanate (led by the Walashma dynasty of the Ifat Sultanate), Sultanate of Mogadishu, Ajuran Sultanate, Warsangali Sultanate, Geledi Sultanate, Majeerteen Sultanate and Sultanate of Hobyo. The kingship system has been an integral part of the more centralized African societies for millennia. This is especially true in the West African sahel, where royal courts have been in existence since at least the era of the 9th century Takrur and Ghana empires. The ruler of the 13th century Mali empire, Mansa Musa, brought a large number of his courtiers with him on the Islamic Hajj pilgrimage to Mecca. Today, the courts of the Ashanti nanas in modern Ghana, the Mande members of the tunkalemmu caste in Mali, the Bamum sultans of Cameroon, the Kanem shaykhs of Chad, the Hausa emirs of northern Nigeria, the inkosis of the Southern African Zulus and Xhosas and the obas and baales of Yorubaland, amongst others, continue the pageantry and court lifestyle traditions once common to the continent. All four major Caliphates had sophisticated courts; this enabled Córdoba, Cairo and Baghdad (the respective seats of the Umayyad, the Fatamids and the Abbasids) to become the largest, most culturally developed cities of their time. This drew talented people from all walks of life—such as musicians, singers, poets and scientists—to seek employment under the patronage of elite bureaucrats, emirs and Sultans at court. The other Caliphate was the Ottoman, which employed its court's culture to stabilize an empire inhabited by huge non-Islamic populations spanning three continents. Everything from Algeria to the Balkans to Yemen was controlled by the court in Istanbul. The royal courts in the Islamic world were mostly run by rulers, but there were the exceptions of important elite families such as Barmakids and Nizams who established their own minor courts, enabling them to encourage arts and improve the empire even if the ruling king was useless. 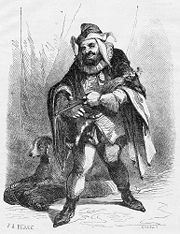 "Triboulet", illustration for the theater play "Le Roi S'Amuse" ("The King Takes His Amusement") by Victor Hugo. Gravure by J. A. Beaucé (1818-1875) and Georges Rouget (1781-1869). Earlier courts in medieval Western Europe were itinerant courts, but courts were often held in a fixed place. One of the criteria of Norbert Elias' concept of a court society is that it existed in space. [clarification needed]. The German word Hof, meaning an enclosed courtyard, can also apply to a rural farmstead with outbuildings and walls forming the perimeter. It has also been used for the palatial seat where the court was held. Thus Hof or "court" can become transferred to the building itself. For example, the grand residence Hampton Court Palace on the River Thames above London was where Thomas Wolsey held court as Catholic cardinal (built after the Italian ideal for a cardinal's palace) until his fall and its confiscation by Henry VIII. William and Mary also held court there, 1689–94. Though it is built round two main courts, the structure itself is no longer the seat of a court in the sense of this article. As an example, ambassadors to the United Kingdom are still accredited to the Court of St. James's, and courtiers of the monarchy may still have offices in St James's Palace, London. The present monarch, however, holds court at Buckingham Palace, where dignitaries are received. The Haute Cour (High Court) was the feudal council of the Kingdom of Jerusalem. Ali Qapu Palace, imperial palace of the later Safavid emperors in Isfahan, Iran. Palatine Hill in Rome, Italy. Origin of the word palace. ^ Velde, François Velde (25 February 2004). "Legitimacy and Orders of Knighthood". Heraldica. Retrieved 25 February 2015. ^ Radner, Karen (22 September 2011). The Oxford Handbook of Cuneiform Culture. Oxford, UK: Oxford University Press. pp. 358–379. ISBN 978-0-19-955730-1. ^ ChinaKnowledge.de encyclopedia, "Archived copy". Archived from the original on 2013-05-31. Retrieved 2012-12-07. CS1 maint: Archived copy as title (link). Alternatively, the sequence was translated as prince, lord, elder, master, chieftain: Brooks 1997:3 n.9. ^ Groß, Melanie; Pirngruber, Reinhard (September 2014). "On Courtiers in the Neo-Assyrian Empire: ša rēsi and mazzāz pāni" (PDF). Imperium and Officium Working Papers (IOWP). Retrieved 24 February 2015. ^ Dandamayev, Muhammad. "COURTS AND COURTIERS i. In the Median and Achaemenid periods". Encyclopædia Iranica. Encyclopædia Iranica. Retrieved 24 February 2015. ^ electricpulp.com. "PERSEPOLIS – Encyclopaedia Iranica". www.iranicaonline.org. Retrieved 19 March 2018. ^ Maria Brosius (2007). Spawforth, A. J. S., ed. The Court and Court Society in Ancient Monarchies. Cambridge UK: Cambridge University Press. pp. 1–57. ISBN 978-0-521-87448-9. ^ Tony Spawforth (2007). Spawforth, A. J. S., ed. The Court and Court Society in Ancient Monarchies. Cambridge UK: Cambridge University Press. pp. 93–97. ISBN 978-0-521-87448-9. ^ Canepa, Matthew (2 February 2010). The Two Eyes of the Earth: Art and Ritual of Kingship between Rome and Sasanian Iran. University of California Press. ISBN 978-0520257276. ^ Kazhdan, Alexander P.; McCormick, Michael (1995). "The Social World of the Byzantine Court" (PDF). In Maguire, Henry. Byzantine Court Culture from 829 to 1204. Harvard University Press. p. 175. ISBN 9780884023081. ^ Angelov, Dimiter G. (2003). "Byzantinism: The Imaginary and Real Heritage of Byzantium in Southeastern Europe". New approaches to Balkan studies. Brassey's. pp. 3, 11. ISBN 1574887246. ^ Angelov, Dimiter G. (2003). "Byzantinism: The Imaginary and Real Heritage of Byzantium in Southeastern Europe". New approaches to Balkan studies. Brassey's. p. 8. ISBN 1574887246. ^ Oosterwijk, A Van (1 February 2013). Staging the Court of Burgundy (Studies in Medieval and Early Renaissance Art History). Brepols Publishers. ISBN 1905375824. Elias, Norbert (1983) . The Court Society [Die höfische Gesellschaft]. trans. Edmund Jephcott. Oxford. . On the sociology of the court, originally completed in 1939. Fox, Robin Lane (1973). Alexander the Great. Branner, Robert, et al., eds. Art and the Courts: France and England from 1259 to 1328, 2 vols. Ottawa, 1972. Bumke, Joachim. Courtly Culture: Literature and Society in the High Middle Ages. Berkeley and Ozford, 1991. Hen, Yitzhak. Roman Barbarians: The Royal Court and Culture in the Early Medieval West. Basingstoke: Palgrave Macmillan, 2007. ISBN 978-0-333-78665-9. Jaeger, C.S. The Origins of Courtliness: Civilizing Trends and the Formation of Courtly Ideals 939–1210. Philadelphia, 1985. Jones, S.R., R. Marks and A. J. Minnis (eds.). Courts and Regions in Medieval Europe. York, 2000. Jong, M. de and F. Theuws (eds.). Topographies of Power in the Early Middle Ages. Leiden, 2001. Scaglione, A. Knights at Court: Courtliness, Chivalry, and Courtesy from Ottonian Germany to the Italian Renaissance. LA and Oxford, 1991. Scattergood, V.J. English Court Culture in the Later Middle Ages. London, 1983. Vale, Malcolm. The Princely Court: Medieval Courts and Culture in North-West Europe. Oxford: Oxford University Press, 2001. Adamson, John (ed.). The Princely Courts of Europe, 1500–1750. Ritual, Politics and Culture under the Ancien Régime, 1500-1750. London, 1999. Asch, Ronald G., and Adolf M. Birke, eds. Princes, Patronage and the Nobility: The Court at the Beginning of the Modern Age, c.1450-1650. London and Oxford, 1991. Birke, A., and R. Asch (eds.). Courts, Patronage and the Nobility at the Beginning of the Modern Period, 1450–1650. 1991. Charles-Edwards, T.M. et al. The Welsh king and his court. Cardiff, 2000. Dickens, A.G. (ed.). The Courts of Europe: Politics, Patronage and Royalty, 1400–1800. 1977. Emphasis on patronage. Duindam, Jeroen. Myths of Power: Norbert Elias and the Early Modern European Court. Amsterdam, 1995. Critique of Elias. English translation of dissertation Macht en Mythe (1992). Duindam, Jeroen. Vienna and Versailles. The courts of Europe's Dynastic Rivals 1550-1780. Cambridge, 2003. Elias, Norbert. The Court Society. Oxford, 1983. "Bibliography of Early Modern courts 1580–1700, structure and patronage" (PDF). Oxford University. 2002. "Court culture: representations of intimacy". Oneonta.edu. Division between Hall and Chamber in late medieval noble and royal households. Herbermann, Charles, ed. (1913). "Court (in Scripture)" . Catholic Encyclopedia. New York: Robert Appleton Company. "The Society for Court Studies". Courtstudies.org. Bibliography on court history. Wikimedia Commons has media related to Noble courts. This page was last edited on 31 March 2019, at 22:04 (UTC).